The tilting wall mount is suitable for 32" - 70" flat-panel TVs. Its tilting system makes it easier to adjust the viewing angle. The design ensures TV mounting stability and security. Adjustable TV brackets offer lateral shift movement to allow perfect TV position, even with off-center wall wood studs. TV is positioned just 1.2" / 30.4 mm from the wall for a clean, low-profile appearance. Comes with a 6 feet HDMI cable, a 6 inch 3-Axis Magnetic bubble level and 5 pcs cable tie, to save you time and money! First, please check your wall for wood studs. Our mount can also be used on concrete walls however, concrete anchors are not included. It can't be used on drywall. Finally, look at the back of your TV. Find the mounting holes and measure the horizontal and vertical distance. If the horizontal distance is within 24" and the vertical distance is within 16", then the bracket will work perfectly for you. The width of your TV should be 26" or above. Otherwise the mount is too wide to hide behind your TV. The wall mount is tested to hold 4 times the weight they're rated to based on UL standard. UNIVERSAL DESIGN: Tilt wall mount for 32" - 70" flat-panel TVs up to 132lbs / 60 kg, VESA(mounting hole pattern) - compatible faceplate fits VESA 200X100mm (8"x4") 200X200mm (8"x8") 300X200mm (12"x8") 300X300mm (12"x12") 400X200mm (16"x8") 400X300mm (16"x12") 400X400mm (16"x16") 600X400mm (24"x16"). Please check VESA (mounting hole pattern), TV weight, wall stud location and possible blocked cable/input. SAFE TO USE: High quality steel construction ensures safety, this TV mount has high standards, which is tested to hold 4 times the weight they're rated to based on UL standard, it has a locking mechanism with quick release which easily secures TV to the wall. EASY INSTALLATION: Easy to install on either 16" or 24" wall wood studs with standard hardware; Tilt 7 degree, lateral shift for perfect placement and centering on your wall. SAVE SPACE: Low profile tilting holds TV close to the wall, Back of the TV stays 1.2" away from the wall for a clean low-profile appearance. 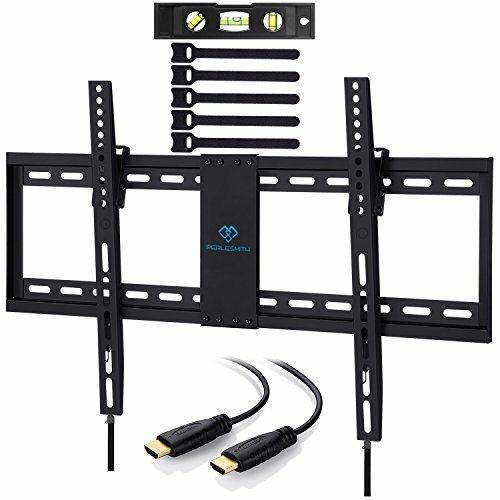 PRODUCT INCLUDES: Standard mounting hardware, 6 ft HDMI cable, 3-Axis magnetic bubble level, 5 pieces pack of cable tie, and our incredible 5-year warranty and friendly customer service. We provide what you need to make installation as easy and convenient as possible!